Biopreservation Market size is set to exceed USD 9.5 billion by 2024; according to a new research report by Global Market Insights. Growing prevalence of lifestyle disorders such as diabetes and obesity worldwide will escalate the demand for regenerative medicines in disease treatmnet. According to the International Diabetes Federation, India accounted for around 72,946,400 diabetes cases in 2017 and majority of them suffer from kidney disorders. Rising burden of such chronic diseases lead to severe tissue and organ damage or disabilities. Such factors will boost the demand for regenerative medicine thereby augmenting biopreservation industry growth over the forecast timeframe. Technological advancements due to growing R&D activities in the field of biopreservation will ensure biopreservation market growth over the forecast period. Significant increase in the number of biobanks coupled with growing awareness among people regarding stem cell therapies is the key contributor in stem cell market that will subsequently spur biopreservation market size. However, development in technology such as emergence of room temperature storage technology may impede biopreservation industry growth over the coming years. Equipment segment was valued at USD 3.2 billion in 2017 and is estimated to show considerable growth over the analysis period. Segmental growth is attributed to high demand for equipment such as freezers, refrigerators, cryo-liquid nitrogen tanks as well as consumables including cryo-bags, vials and tubes. Increasing adoption of regenerative medicine will further foster the segmental growth during the forthcoming years. Biobanking segment dominated the biopreservation market in 2017 and is estimated to show 13.2% CAGR over the forecast timeframe. Increasing demand for organ transplantation coupled with technological advances in biopreservation techniques will accelerate segmental growth during the forthcoming years. Collaborations of biopharmaceutical companies with national bio-banks and tissue preservation centers will further drive the business growth. Mesenchymal stem cells (MSC) segment accounted for 14.9% revenue share in 2017 and the segment will witness significant growth in the coming years. The segment growth is attributable to the properties of MSCs including ability to promote cell growth, modulate patient's immune system and differentiate into more specialized cell types. Increasing adoption of these cells in various disease diagnosis such as rheumatoid arthritis, liver cirrhosis, spinal cord injury and chronic wounds will spur revenue size. U.S. biopreservation market dominated North America region and was valued at USD 1.6 billion revenue in 2017 due to rise in the number of biobanks in the U.S. Increasing new drug development and therapies in biomedical research coupled with increasing investment in R&D will boost U.S. biopreservation market growth. Moreover, various organizations in the U.S. such as the Cooperative Human Tissue Network (CHTN) funded by the government are encouraging and focusing on the bio-banking and bio-preservation market growth. 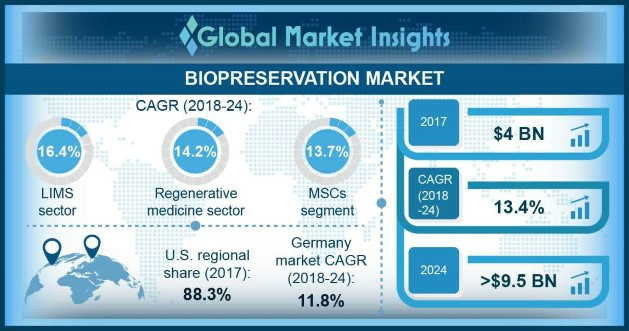 Germany biopreservation market is estimated to witness lucrative CAGR of 11.8% over the forecast timeframe owing to growing need for effective therapeutic options for treatment of chronic lifestyle disorders. Growing adoption of cell and gene therapies for disease treatment coupled with various government initiatives will foster industry growth. Furthermore, the German Health Research Council (GFR) is recommending focus on biopreservation and biobanking to strengthen the infrastructure of German Health Research that will further accelerate the regional growth. Prominent industry players operating in the biopreservation market include BioCision, Biomatrica, BioLife Solutions, Chart MVE Biomedical, LabVantage Solutions, Atlanta Biologics, Taylor-Wharton Cryogenics, Panasonic Biomedical, Thermo Fisher Scientific, Qiagen, VWR International, Custom Biogenic Systems. The industry players primarily focus on certain strategic initiatives such as new product launch, merger, acquisitions and partnership to capitalize on market opportunities and strengthen their market position. For instance, in June 2015, Qiagen announced the launch of new Investigator STR assay kits in the U.S. for analysis of DNA evidence in forensic laboratories. The new genetic fingerprint kits, providing cohesive solution to instantaneously analyze numerous key genomic markers for DNA matching enabled company to enhance its existing product portfolio.